What is crossrange and downrange for an entry vehicle? I have been searching the terms online but still can't get a more intuitive understanding. If you could refer me to some website, book or if you could offer me an explanation I would really appreciate it! Thanks! Downrange is the distance traveled in the direction of flight. Imagine the orbit of a spacecraft as a circle around the Earth, 'downrange' is the distance traveled along this path. When you do a ballistic (uncontrolled) reentry, this is the path you travel. 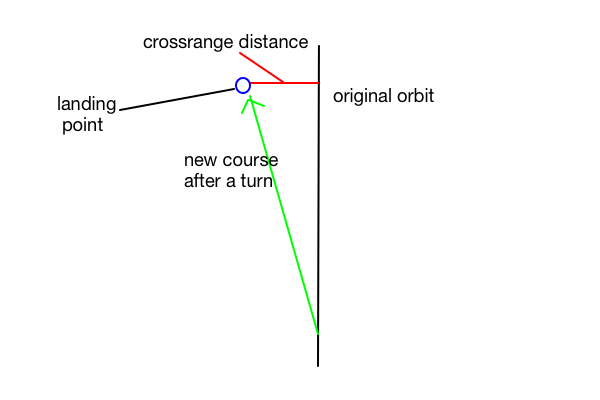 Crossrange comes into play when you make a turn, and you deviate from your orbit. It's the distance between the spacecraft and the path of its original orbit. My own image, it's a top view of the original orbit and the effect of making a turn early in the reentry trajectory. The Shuttle was capable of a large crossrange distance on reentry: they wanted to be able to land ~2000 km away from the orbital path. This meant they could launch from Vandenberg in California into a polar orbit, make 1 orbit and then land back in California. 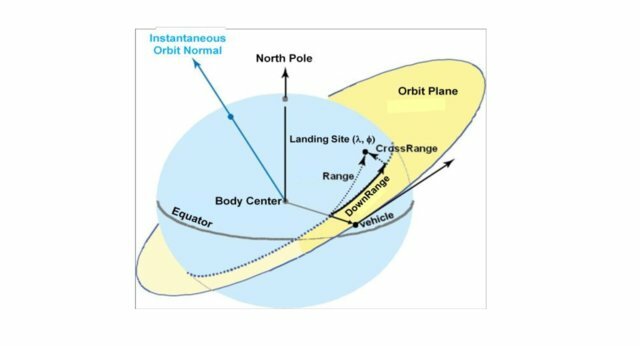 That 1 orbit took 90 minutes, in which the Earth rotated by ~2000 km, so a downrange landing would put the Shuttle in the Pacific, 2000 km off the West coast. Not the answer you're looking for? Browse other questions tagged reentry entry-descent-landing or ask your own question. Could a modified Jiffy Pop container survive atmospheric re-entry to deliver fresh popcorn anywhere in the world?